An additive manufacturing (AM) system has been introduced by EOS with a build volume of 400 x 400 x 400 mm that transforms the process from a prototyping and small-volume production tool into a manufacturing centre for high-volume production of high-quality, industrial metal components, directly from CAD data. The company will use MACH as a platform to launch the system in the UK, following its world premiere at the EuroMold 2013 show in Frankfurt at the end of last year. 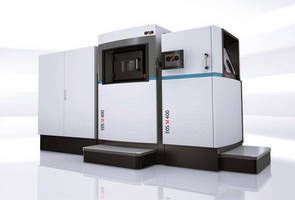 The machine, called EOS M 400, produces parts from metal powder, layer by layer. It is the first of a new generation, building on established metal AM machines in the company's range. The modular, extendable platform is aimed at industrial production applications, as the increased volume of the build chamber (400 x 400 x 400 mm) allows the manufacture of larger components or multiple smaller parts within a nested volume. In addition, the level of automation has been raised, commensurate with serial production. EOS M 400 delivers improved quality assurance and is easier to use, answering key requirements of customers. The basic model will start to become available in the Spring of 2014, with global distribution planned from the summer. Dr Adrian Keppler, Managing Director at EOS, said, "We are pursuing a platform-based strategy for metal AM technology and are able to support customers from the research and development phase through to series production." "EOS M 400 represents the key to industrial production, as it takes our existing EOSINT M 270 and EOSINT M 280 technical benchmarks a step further." "The new system supports users not only in the context of its productivity, but also in actual manufacturing applications, as we will be expanding the platform with successive performance modules." Within a year, automated unpacking will be available for the EOS M 400. With this extension of the system, an exchangeable frame including components and residual powder can be moved, following the build process, from the process station to the unpacking station. Here, loose and excess powder will quickly be cleaned away by programmable rotation and vibration. The modular concept makes it possible to incorporate the unpacking station retroactively to expand on the set-up and process stations. Users thereby gain a future-oriented e-manufacturing solution designed for application-specific extension. The first extension to the basic model, with its corresponding processes, will initially be offered with EOS Aluminum AlSi10Mg and EOS NickelAlloy IN718 materials and is therefore particularly suited to use in the automobile and aerospace sectors. Processes for further materials are still in the development phase, including both tool steel and titanium. In the EOS M 400, the laser has an output of up to 1,000 watts, allowing the use of materials that require more power. A new user interface with touchscreen, developed following discussions with many customers, further simplifies system usability. The handling process has been enhanced and additionally the filter from the air filtration system is automatically cleaned and has a significantly longer service life. EOS has also further optimised the monitoring and reporting functions, enabling the user to enjoy improvements in quality control. From 2015, EOS is planning to offer in addition to the EOS M 400 the EOS M 400-4, which will have four lasers. While the single-laser version opens the way for the development of new applications, the focus of the multi-mode variant lies in achieving productivity increases in qualified production processes that have been achieved already for the EOSINT M 280. A second AM system launched by EOS at EuroMold 2013 was the EOS P 396 system for the production of parts from plastic powders. MACH 2014 will give visitors that did not attend the show in Frankfurt an opportunity to learn more about the new machine. The successor model to the established EOSINT P 395, it offers a multiplicity of features that comprehensively meet the growing demand for increased manufacturing efficiency, process stability and build capacity. The latest generation of CO2 laser, rated at 70 W, together with completely revised temperature regulation enable double-digit increases in productivity. In addition, a new EOSAME feature ensures reproducible part quality throughout the build chamber, even at the highest fill levels. Global distribution of the EOS P 396 begins in April 2014. Adrian Keppler, Managing Director at EOS, explained, "With the presentation of EOS P 396, we are sustaining a leading role in plastics-based AM alongside our metal technology." "The EOS P 396 seamlessly supersedes our successful EOSINT P 395 model in the mid-frame segment." "We have made a number of improvements that allow our customers to produce plastic prototypes and serial parts with an even higher degree of quality and cost efficiency." Primary processing times are shorter thanks to the introduction of the new and significantly higher performance laser. A reduction in secondary processing times is achieved by a number of features, including a low wear, high speed recoater and a new point pyrometer, which continually measures the temperature of the powder surface to a high degree of precision. Furthermore, this feature forms the basis for more stable regulation of the production process, improving reliability. With the availability of Release 3.7 of EOS' process software (PSW), the functional scope is once again expanded and Windows 7 is supported. The build capacity of the EOS P 396 is in line with that of its predecessor, at 340 x 340 x 600mm. Energy and material consumption of the EOS P 396 per manufactured component has been improved, however, resulting in a reduction in operating costs and optimised carbon footprint. Cost savings of some 30 per cent per part are achievable compared with the system's predecessor. The EOSAME feature, which regulates energy input, is a central contributor to the further optimisation of components produced. The mechanical characteristics are standardised so that the quality of the part remains the same irrespective of its position within the build chamber. Plastic powder materials PA 2200 and PrimePart PLUS (PA 2221) will be commercially available for the EOS P 396 from April 2014. Further materials will follow in several stages until all of the powders approved for the EOSINT P 395 are available.